We are solving series of problems based on thermal properties of matter and our present topic in focus is thermometry. It is about measuring the temperature. Heat is foam of energy and it is the cause and its effect is measured in terms of temperature and it is seen as effect. Without measuring heat energy in terms of temperature, we cannot identify the exact effect of heat energy on the body. 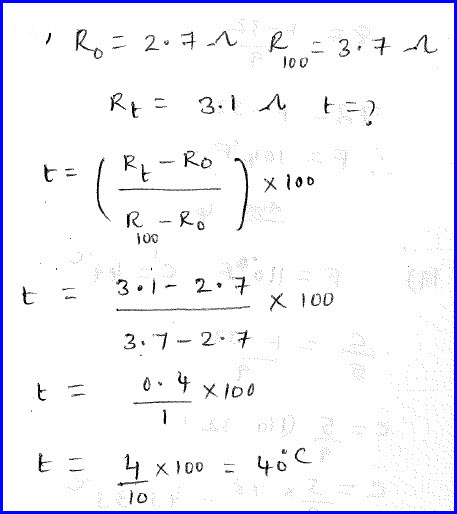 Temperature can be measured on any uniform parameter that changes uniformly with the given heat energy. It could be linear expansion, pressure, volume, resistance etc. Basing on any of this property, we can measure the temperature of the body. To measure the temperature, we have different kind of scales like centigrade, forignheat, kelvin.. etc. 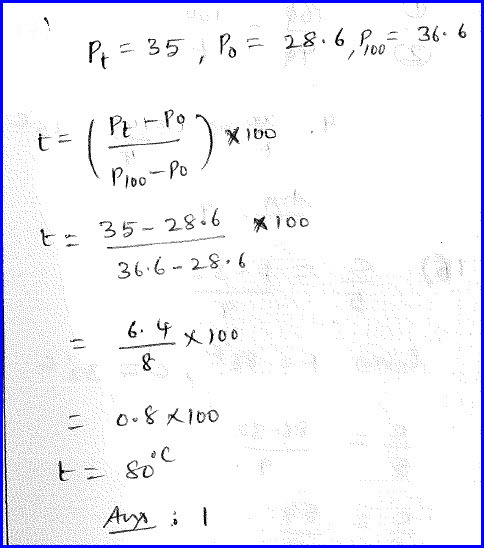 Which of the available scales of the given options is the smallest scale value and the problem is as shown in the diagram below. Each scale is divided into different parts as per the convention and convenience. Any way when we measure the temperature of the same body using different scales, the value appears different as per the scale. We can find that the forignheat scale is the one who is having 180 divisions and it is the largest among all the scales. As the number of divisions are largest, the numerical value of the system will be the smallest. Solution is as shown in the diagram below. Super conductivity is observed at a temperature 95K and we need to express it in terms of forignheat and the problem is as shown in the diagram below. 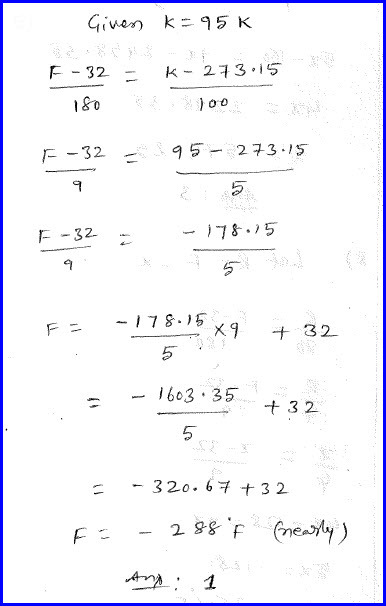 We know that forignheat scale divided into 180 parts where as kelvin scale is divided into 100 parts. 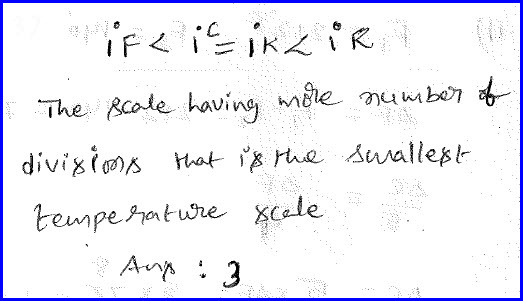 We know the relation between different scales and we can solve the problem as shown in the diagram below. We need to know where the temperature reading of centigrade scale coincides with forignheat scale and the problem is as shown in the diagram below. We need to equate the temperature reading both the scales. 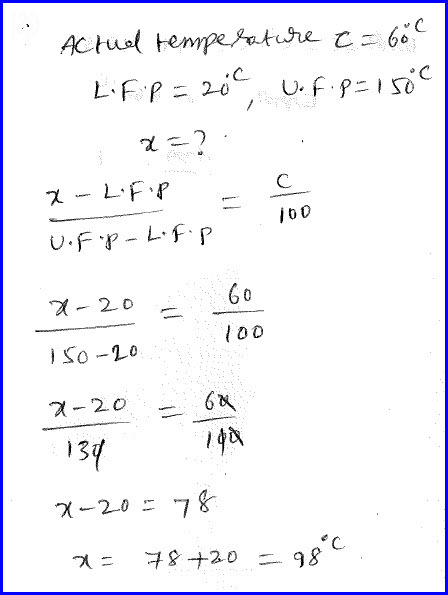 We know that the ratio of given reading to the lower fixed reading to the difference between upper and lower fixed points is constant and by applying that data, we can solve the problem as shown in the diagram below. In a wrongly calibrated thermometer lower fixed point is 20 and upper fixed point is 150 centigrade and we need to know if the actual temperature is 60 degree how much that is read as by this new thermometer and the problem is as shown in the diagram below. We know that the temperature of the body depends on the heat energy that it has and it looks different when we see it through different scales. 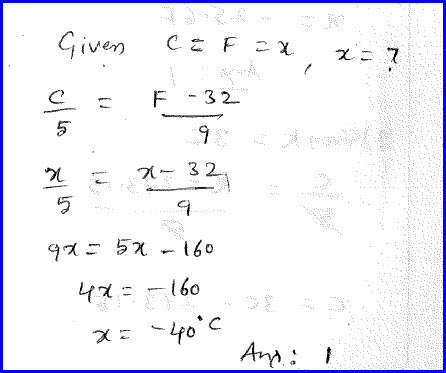 A wrongly calibrated thermometer reading shall be equated to the normal reading as shown in the diagram below and the problem is solved as shown here. The resistance of a wire at zero and hundred degree centigrade is given to us and we need to measure the reading at a particular temperature and the problem is as shown in the diagram below. We need to know that many of the metals temperature raises with the raise of the temperature and they are proportional to each other. Taking this into consideration, we can define coefficient of thermal resistance as shown in the diagram and the problem can be solved as shown below. 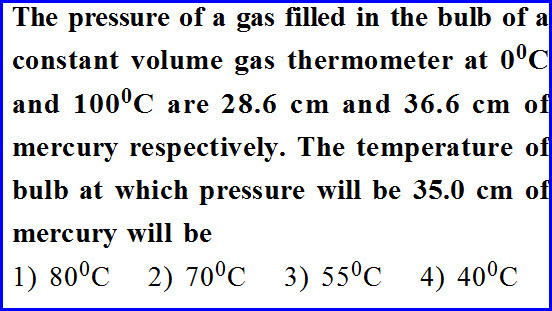 The pressure of the gas at zero and hundred degree centigrade is given to us and we need to find the pressure at a given temperature and the problem is as shown in the diagram below. We know that the pressure of a gas at constant volume is directly proportional to the temperature of the gas and taking that into consideration we can define pressure coefficient of a gas at constant volume. Basing on the definition, we can solve the problem as shown in the diagram below.